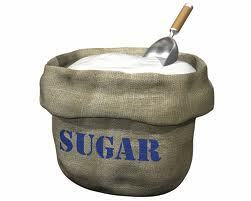 Does eating too much white sugar cause diabetes? Imagine a 152 pound sack of sugar. That’s how much sugar from calories the average American consumes in one year. Not all of it is white sugar – about half is from fruits and vegetables, the way nature intended. But the other half, the bad half so to speak, is from added sugar in sweetened drinks, bakery items, candy, snacks, you name it. The first 40 pounds causes no harm, according to the Food and Drug Administration. But the other half is suspected of contributing to a number of diseases. In 1980, one in 7 Americans were obese and 6 million were diabetic, a statistic which hadn’t appreciably changed for twenty years. By 2003, one in three Americans were obese and 14 million were diabetic. The USDA estimates that in 1950, Americans consumed 109 pounds of sugars per year; in 1970, 123 pounds; and in 2000, more than 152 pounds per year. Most people who were given those facts might assume that the increase in our consumption of sugar directly correlates to the increase in obesity and Type 2 diabetes. But the link between the two is as they say in court, circumstantial evidence. The link between sugar and diabetes is a complicated one, but white sugar does not directly lead to diabetes. The cause of diabetes was beautifully explained in an article in the New York Times: “You secrete insulin in response to the foods you eat — particularly the carbohydrates — to keep blood sugar in control after a meal. When your cells are resistant to insulin, your body (your pancreas, to be precise) responds to rising blood sugar by pumping out more and more insulin. Eventually the pancreas can no longer keep up with the demand or it gives in to what diabetologists call “pancreatic exhaustion.” Now your blood sugar will rise out of control, and you’ve got diabetes. Okay, so a fatty liver may be the primary cause of insulin resistance, a.k.a. diabetes, whether you’re lean or obese. So what makes your liver fatty? The culprit is too many carbohydrates, which include sugars. And not only white sugar is a carb – that also includes brown sugar, turbinado sugar, honey, syrups, even the fructose found in fruit. Simply put, anything that tastes sweet. But don’t get the idea that carbs should be automatically eliminated from your diet if you become diabetic. Your body in fact needs them, just not in the quantity you’ve been feeding it. Now if you’ve been connecting the dots, you’ll realize that starchy foods and all kinds of sugars/sweeteners spike blood sugar levels (glucose), and the extra calories will be stored in your liver as fat, which may eventually lead to insulin resistance. Some researchers suspect that the reason the diabetes and obesity epidemics are linked so closely together is that starch and sugar is overly abundant in the processed foods we eat – foods that come in a bag or a box from the grocery store or fast food drive-through. Much of this food is intentionally created to have a high glycemic value (high starch+lots of sweeteners), so that our brains and bodies find it instantly satisfying. Not surprisingly, our consumption of these types of food has also vastly increased in the past 30 years. A plain and simple rule for optimum health and weight: Eat a well-rounded, balanced diet that focuses on fresh food and goes easy on the sweets and starchy foods.